All options are described below. Parallel document processing - this setting configures number of documents that ReplaceMagic will process in parallel. This number is limited by hardware power (CPU, memory, IO) and on each computer can be different. Default is 10 but you can experiment and change this number based on hardware usage during processing. Keep in mind that more does not mean faster - if you set 100 but your computer can process only 20 there will be a lot of CPU waits. Use Task Manager to check hardware usage. Suppress Warning - by setting this ReplaceMagic will show limited number of warnings. This option should be set only if you are experienced ReplaceMagic user. Enforce memory cleaup => by setting this parameter ReplaceMagic will do memory garbage collection every 100 processed documents reducing used memory. Enable results filtering => by setting this after processing result grids will have in first row filter fields where you can define what will be visible. This does not have impact on export as it is always complete no matter on set filter. File size in => used to set in which units file size will be shown in Scan document tab results. % of memory used by ReplaceMagic => used to set % of total memory that ReplaceMagic can utilize. In case that ReplaceMagic is using more memory than available % it will stop processing new documents as long as memory does not decrease below limit. Wait X second(s) for threads to finish in Configuration - this parameter instructs ReplaceMagic to wait X seconds before it writes to Console summary about current processing. Without this parametar might happen that ReplaceMagic writes summary before processing is finished which will lead that some files are not included in summary. Skip files bigger than ... MBytes - in case that some value <>0 is set ReplaceMagic will skip files bigger than that value. List processed documents in Console view - by setting this during processing ReplaceMagic will constantly update Console view with processed documents. This has small performance impact but provides immediate response what is processed. Check does Hyperlink exist? - by selecting this option ReplaceMagic will check do all if found hyperlinks (HTTP and HTTPS) exist. This has performance impact! Open document with path longer than 260 characters - due to slight performance impact this option is disabled. If needed let us know and we will enable it. Windows has limitation that it cannot open documents if path is longer than 260 characters. To go around this limitation we introduced this feature. If this option is disabled all documents where path is longer than 260 characters will be reported as not accessable. Number of HTTP connections - per default only two connections are used to check is hyperlink ok or not. Over this parametar you can influence how many connections should be used. URLCheck Sleep time parameter is used to set number of miliseconds that ReplaceMagic will wait before remote server response during URLCheck is returned. This is useful in case that there is slow network connection to remote server. Default value is 0. HTTP Request timeout - by seting value for this parameter you can define how long ReplaceMagic will wait on remote server to return info is hyperlink ok or not. If timeout happens ReplaceMagic will report that hyperlink is broken. Skip TextToDisplay in PDF documents (memory decrease) - in case that TextToDisplay is enabled in case of bigger PDF documents memory can grow a lot. To disable this we included this option so ReplaceMagic will skip TextToDisplay. Update Read Folders status (not for productive usage) - by setting this parameter when you click on Scan Documents you'll see documents that are added for processing. Withouh this parameter you'll see only "Reading folders". This setting is not recommended for productive usage as has performance impact. Continue replacements after first change? - per default, when first replacement is done (hyperlinks, OLE links, Link Source, Pivot tables) ReplaceMagic will stop processing of already changed link. By setting this parameter ReplaceMagic will try to make change for each search&replacement string which is provided. Ultra fast document scan (no extra data) - with this setting you are instructing ReplaceMagic only to add found documents in Find Documents result table. This will be very fast but you will not get any document content information (hyperlinks, OLE Links, Link Sources or Pivot Tables). Do not change file links if replacement is longer than 235 characters - in case if replacement string is longer than 235 characters change will not be done. Reason is that Office cannot read longer path so it might report that document is corrupted. To avoid that set this parameter. 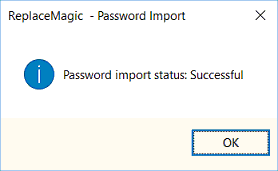 Try multiple passwords - to enable ReplaceMagic to use imported list of password this option has to be set. After activating this feature ReplaceMagic will always try all imported passwords when it tries to open password protected document. If none of passwords is correct document will be reported as unavailable. Create log file? - by setting this option ReplaceMagic will create log file during scan or search&replace process. Log will have Console tab entries. Always create new log file - by setting this ReplaceMagic will for every scan documents or search&replace create separate log file. Do not change "Last modified date", "Author" and "Editor" => in case that you want to keep SharePoint properties you'll have to select this option. This will instruct ReplaceMagic to keep last modified date, author and editor. If this is not done after making replacement in your documents you'll see that last modification date is changed to date and time when ReplaceMagic made change and that editor is changed to user that you used to login to SharePoint from ReplaceMagic. If this option is selected and ReplaceMagic is making changes we will keep all original last modifed date and editor data. Important remark: ReplaceMagic can keep original SharePoint data only if user used to login to SharePoint from ReplaceMagic belongs to Site Administrator collection. This is limitation of SharePoint. Should ReplaceMagic check-out/check-in documents? - by selecting this option ReplaceMagic will check-out all documents that we are accessing during replacement process and check them in after replacement is done. This will ensure that documents are block for changes of other users during ReplaceMagic processing. Enforce check-in? (all documents checked-out by other users will be checked-in for processing) - by selecting this option if ReplaceMagic is accessing some document that is check-out by some user ReplaceMagic will check-in that document and make processing. Of course, during processing we will check-out/check-in document. Remark: when document is forcefully checked-in ReplaceMagic will enter check-in comment "ReplaceMagic forced check-in". In case that this option is not selected and we try to access some of checked-out documents that document will appear in list of not processed documents with comment "Document checked-out by SOME_USERNAME and cannot be changed!". This will give you enough information to understand what is the user blocking document for processing in case that you want to contact that person. Per default SharePoint is not allowing that more than 5000 list items are shown/selected. To go around this limitation you'll have to set this parameter specifying when should we merge selection results. This means, if default of 5000 documents is configured, ReplaceMagic will return list of documents in sets of 5000 and always append one set to previously read list of documents. This will allow that we can access also libraries with more than 5000 documents without any limits. Btw. as this parameter is configurable please check with your SharePoint administrators to what value you should set this parameter! All settings changed by ReplaceMagic during processing will be set back to original values after processing is done. If documents where checked-out and we check them in they will stay checked-in. We cannot check them out with prevous user. To be able to keep last modification date, author and editor user used by ReplaceMagic has to belong to Site Administrator Collection. Otherwise we cannot make changes.